There's only one week left until I head off to my next ice show contract. (Eek.) I've been doing a bit of packing and a lot of crafting to gear up for this next adventure. I'll have a full kitchen on this next contract and I couldn't be more excited about it! I've been pinning recipes on pinterest, checking out cookbooks from the library, and leafing through cooking magazines in checkout lines like a woman who is totally obsessed. The obsession has been paying off, though, and I've amassed tons of recipes that I can't wait to make this summer. I wanted to keep all those recipes in one organized place, so I decided to make a recipe notebook. This notebook needed some washi tape on it. Obviously. You can download the Yum! printable right here. 1. A notebook. I used a 9" by 12" sketch pad that was on sale at Micheals for $5. 3. A piece of thick paper to go in between the notebook cover and the printable so the design on the cover of the notebook won't be visible through the printable. 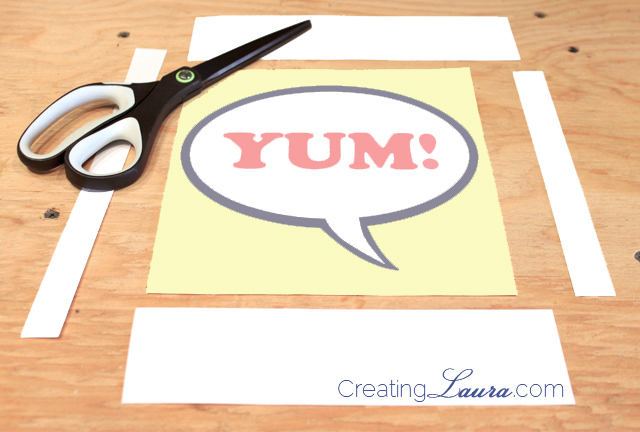 Start by printing and cutting out the free printable Yum! Now set the Yum! aside and start washi taping the notebook. Yes, I did just use "washi taping" as a verb. 1. Cut the thick piece of paper so it's the same size as the notebook, place it on top of the notebook, and use washi tape to secure the two outside corners (the top right and bottom right) so that it looks like there is a triangle of washi tape in those two spots. 2. Place 4 more strips of washi tape on the bottom right corner of the notebook, parallel to the strip in the corner, wrapping the excess tape around onto the back of the cover. Do the same thing on the bottom left corner, but don't wrap the tape around the cover yet. Instead, leave the excess tape hanging off the cover (as pictured above) and then cut it off of the side with the spiral binding with scissors once you've placed all 5 strips of tape. Now you can wrap the excess tape on the bottom edge around the cover. Tape the top corners exactly as you taped the bottom corners. 3. Now that all of the corners are taped, it's time to fill in the middle. Starting at the bottom and working your way up, apply 5 more strips of washi tape as pictured above. This time the tape will be horizontal instead of diagonal. Cut off the rough edges of the tape strips diagonally so they match up with the diagonal tape. 4. Repeat step 3 on the remaining 3 sides of the cover. Once you've done that, your notebook should look like the 4th picture above. Now it's time to place the Yum! 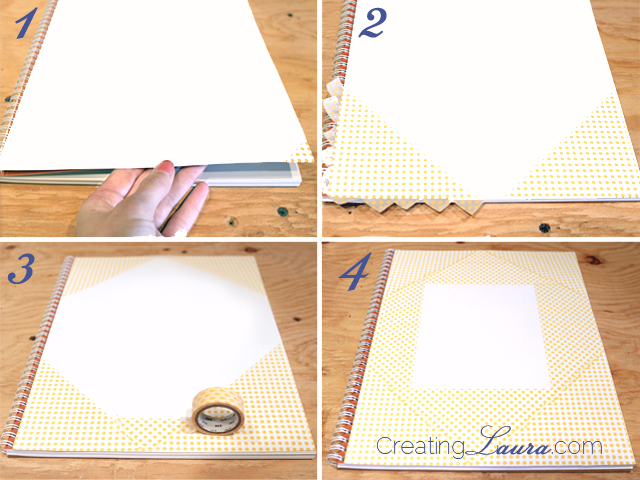 printable in the middle of the notebook and tape down it's entire perimeter using the second type of washi tape. You're notebook cover is all finished (yay!) and it should now look like the very first picture in this post. 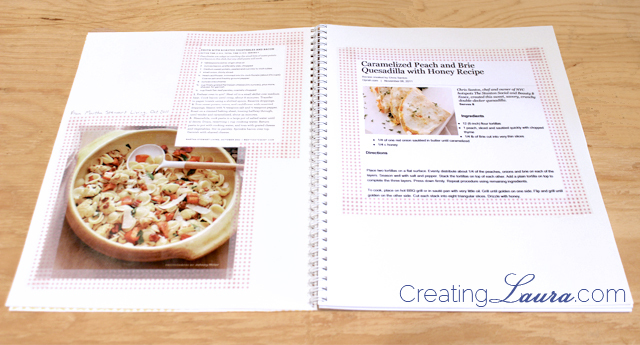 Fill the inside of your notebook with recipes from all over the place: cutouts from magazines, printouts from websites, handwritten notes from your parents' kitchen, etc. 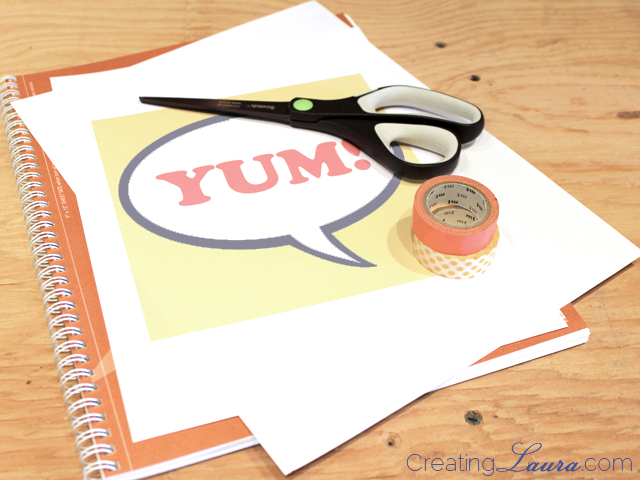 To add a little extra flair, use washi tape to tape in the recipes. That way the inside of the notebook matches the cover and the whole thing will feel more cohesive. 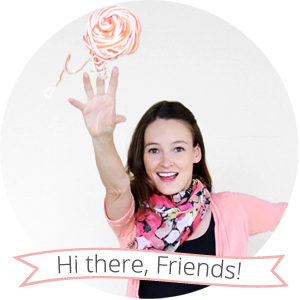 I'm super excited to get cooking, and I hope that this post has inspired you too! 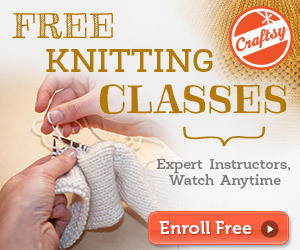 What are your favorite recipes? 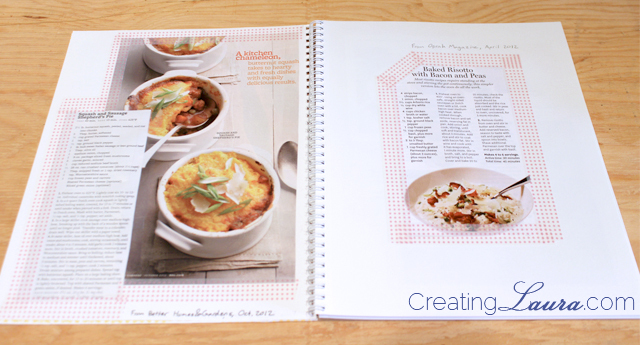 This is such a lovely idea, a kind of cooking scrapbook. I'm yet to purchase any washi tape but this may change things. ;) Leanne. I love washi tape! 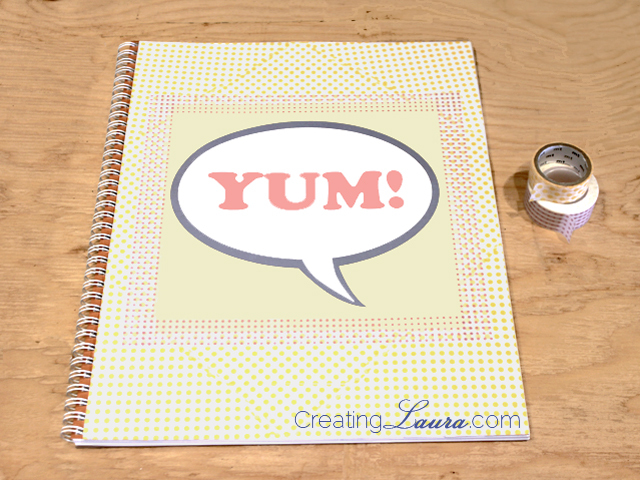 :) My mother is making a cookbook for her 4 children and this is a great printable! cute ! I love washi tape and it's a bonus as a functional decorative element.